Houston is known for its hot summers and mild winters. The weather outside is great. But imagine this. You’ve invited friends over. Everyone is having fun in the sun. But you have feed everyone. And that means locking yourself inside, away from all of the action, right? Well not anymore. With the ever growing trend of outdoor kitchens popping up across the state, its time to check out the latest outdoor kitchen trends. If you are looking to make the most out of your backyard, then incorporating an outdoor kitchen into your home is a great choice. We’ve outlined some things to think about before you jump in and transform your property. You still need to consider all of the usual elements of kitchen design. However, you have to add in extra considerations when designing a room that will be exposed to all weathers. You may only be using it when the weather outside is great. But it still needs to survive the great outdoors when it’s not so good. This means durable materials that won’t easily be damaged by the elements, such as stainless steel. It may be a good idea to know whether you will have the same utilities outside that you do inside. Running water, gas and electric? If so, how will they work outdoors? And if not, your kitchen appliances will need to be chosen with these limitations in mind. It’s not all about the limitations though. An outdoor kitchen can open you up to a whole new world of cooking. With unconventional options such as outdoor pizza ovens and rotisserie smokers gaining attention from kitchen designers. The beauty of an outdoor kitchen is that it is ideal for outdoor entertaining when the weather is great. The logistics of cooking and eating outdoors are simply better. For one, it means the cook can mingle with their guests as they prepare the food. Which I’m sure is a huge incentive. 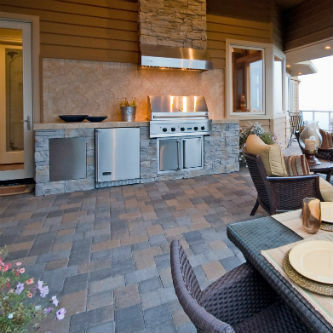 With this in mind, a big trend this year is to make your outdoor kitchen as entertainment-friendly as possible. Beverage centers including wine coolers, ice, and drink preparation surfaces are growing in popularity. As is the use of heaters, lighting, shelter, and music centers. It’s all about entertaining your guests this year. Not just feeding them. Once upon a time, an outdoor kitchen meant boring cinder blocks and practical porcelain tiles. But as outdoor kitchens grow in popularity, the available design options also expand. Powder-coated metal is the next big thing, hard-wearing with a huge variety of colors. It affords you the option of thinking of your outdoor kitchen as an expansion of your home. One that compliments the decor of the rest of the property. Planning for an outdoor kitchen contractor Houston TX project has some special design considerations to keep in mind to make sure it all flows seamlessly. This means it may be a good idea to get in contact with a kitchen design professional to discuss your ideas before you begin.